This is a well kept secret, that not even many of the locals know about! A strange name for such a beautiful place; it is a series of deep rock pools linked by small waterfalls before the creek plunges over the cliff into the Tweed Valley. 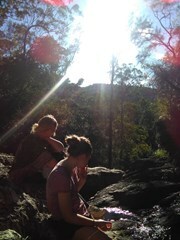 This rock formation is not part of Mt Warning's eruptions, but dates back before that time to the Chillingham volcanics. 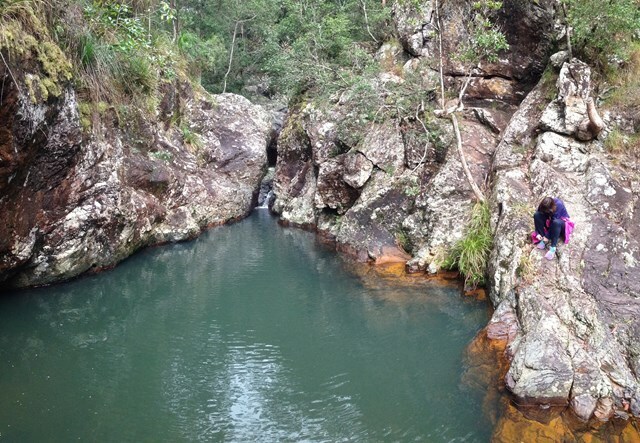 A place for a cooling swim, picnic and to enjoy the tranquillity of the surroundings. It is rumoured that the waters of the rock pools contain a natural hair conditioner that lasts for weeks. Leave Mullumbimby on Main Arm Road. It becomes Skyline Road just before you enter Mt Jerusalem NP and then Manns Road beyond the junction of Middle Ridge Road, which will ultimately take you all the way to Uki. There are great views of the imposing cliffs of Mt Boogarem to your left. 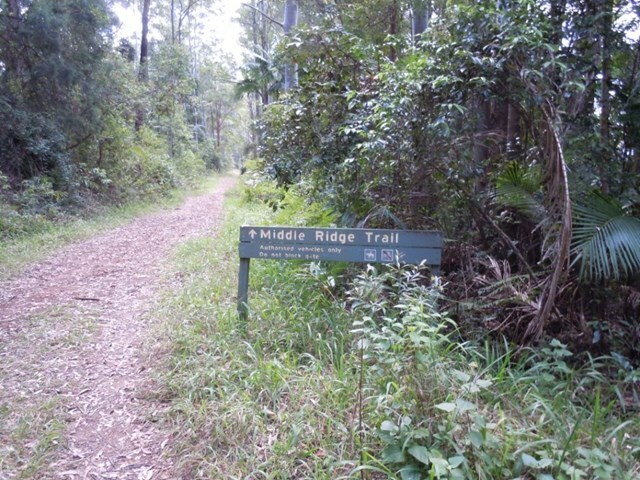 After 16.8km (the last 2.5km are gravel road), turn left into Middle Ridge Road and travel a further 1km to where you will see a gated track to the right called Middle Ridge Trail. There is room to leave cars here. 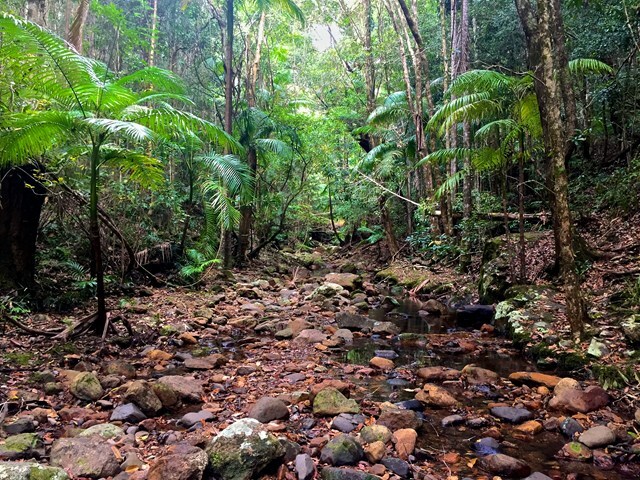 From the Middle Ridge Track gate, follow the trail down for 1km till you reach a fork in the road; take the track to your left, (pink ribboned) for 0.7km till you reach an old bridge over the creek. Watch your step, as the bridge has big holes in it. Immediately after the bridge, take the faint path to your right that runs along the edge of the creek (pink ribboned). 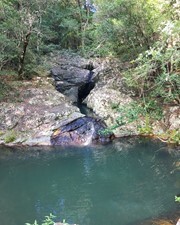 The rock-pools are 200mt along the creek. 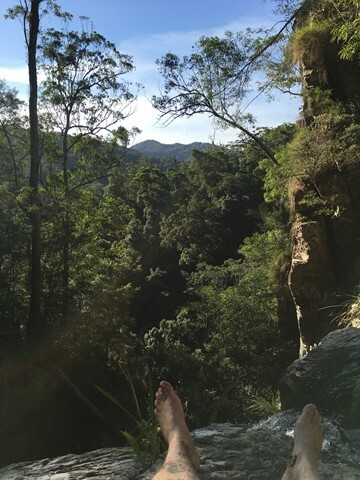 You can rock hop down to the first ledge of the falls (about 20m), but to continue to the bottom would require a bush bash down the left hand side of the gorge. The route is not difficult, representing a 200m drop from the gate to the falls, but in places large trees have fallen across the pathway. No permits, no cost and you get the reward! Book: Bushwalking in the Mt Warning Region. Easy to find with the helpful comments left here from other walkers. 45mins down and an hour back up due to the incline, but wasn’t to hard with a moderate pace. Pools were beautiful and running, although quite cold once you were in! Great hidden gem without the crowds, hopefully it stays hidden for a while longer. 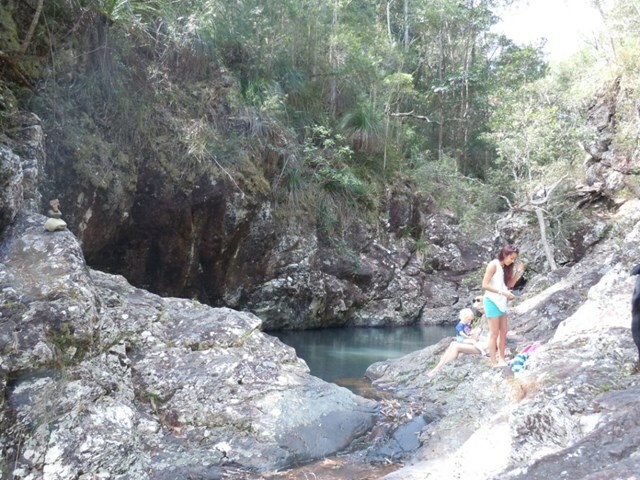 Surprisingly good and nice swimming holes!! Nice walk. Saw a kookaburra, heard whipbirds and possibly cockatoos. 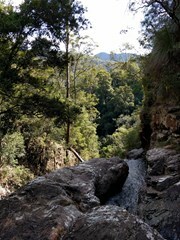 Walked along the creek until the big drop- very slippery and challenging at parts but was gorgeous. Would have been nice to take a swim if it was hot. Wouldn’t take kids to the end as it’s a big drop. Easy first half- coming back got the heart rate up. Clive must be VERY fit. A bit more than a gentle incline, depends what you compare it with, but everyone who we spoke to all said the same thing, medium fitness required. 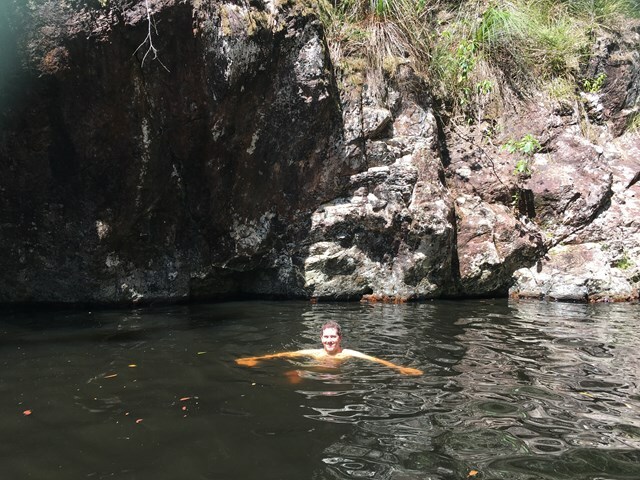 Magnificent, cool, refreshing swim down below, worth the walk. 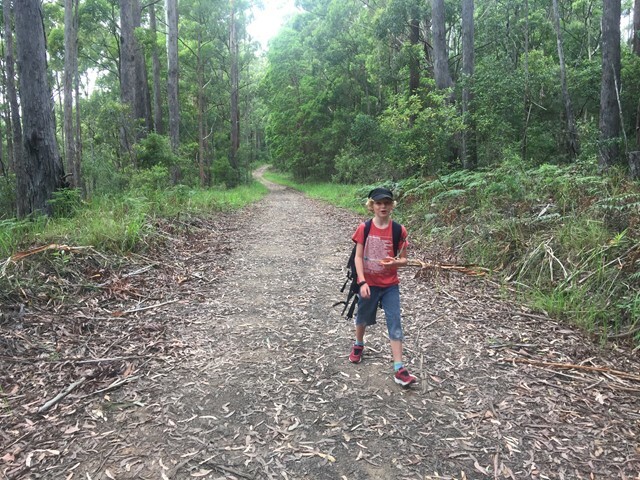 Easy walk with my 9 yr old. 45 mins there and 50 mins back and some time to swim. Walk is very easy to find - first left is a road not a track and there is only one. You cannot miss the bridge or the path to the pools - very simple walking along the river bed. Just remember left along sand ridge road and right over the bridge (although there is nowhere else to go). Well worth the exercise as its just a gentle stroll and not steep just a gentle incline. Road\track looks well maintained by national parks. Awesome walk with incredible water holes and waterfall at the end that you can stand at the top of. If you haven't already, I highly recommend downloading "Maps.ME" for your phone. It's offline maps and you can save GPS coordinates to it before you head out. It is also slightly different to Google Maps in that it is a community based map that you can see other hikes etc that aren't so well known. Such an incredible place. Volcanic rocks, powerful waterfalls, crystal pools to bathe in with stunning views. Go on a sunny day if you can! Bit of a hike getting up there. Probably should have read more of the comments. The GPS tells you to keep on down the road, but the road is cut off. At your first fork, take a left. Then once past the "road closed" sign, hang a right and follow the creek until you get there. Great place. 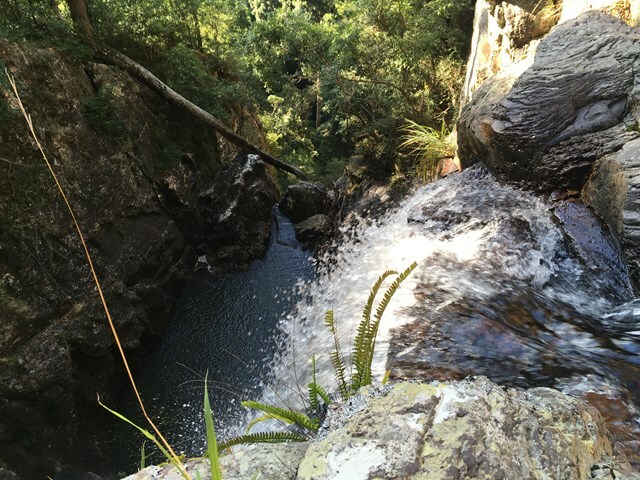 Really beautiful cascading waterfalls and swimming holes. Would definitely go again. The walk back was harder, mostly uphill and very hot. Go early!! No FWD required to get to the track. The sign for the track is posted off the road. you will probably see other cars parked before you see the sign. The walk is easy and even and it's a wide track. It can be confusing when you come to the Crossroads, take the track to the left all the way to the end until you come to a crumbling in desperate need of repair walking bridge - it has giant holes in it so use extreme caution when crossing it. If there's no water in the creek I'd cross there to save yourself a broken ankle. Immediately after the broken head right the track continues for another 200m or so until you reach the Holes. the track is narrow but well worn and you should be able to find the holes with no trouble. Just a side note - if you decide to head right rather than left - this track is much longer and seems to take forever to get to the end - the rock pools at the end aren't that impressive. They are nice - but there are lots of lovely rock pools in the region and this one isn't the best. They are also not 'the' Hells Hole. 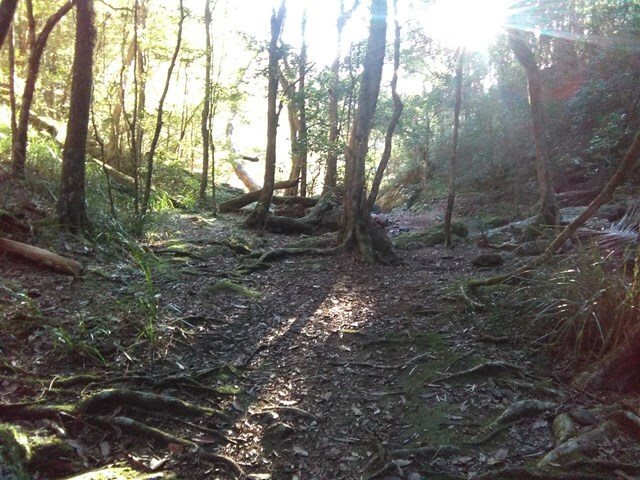 I walked this today after mount warning and I must say I was very disappointed. The water holes were stagnant and covered in insects and there was no one there swimming or anything. And the walk back to the car is hard after walking down hill and not even having a swim. I definitely wouldn't go again. Easy to find once you get out there. Will defiantly be doing this walk again soon! 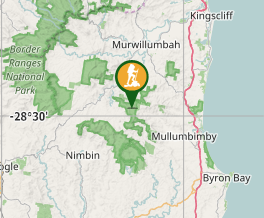 I would recommend access via Mullumbimby in a 2WD car. The dirt road was pretty sketchy coming from the other way. BeckNWood hi. The map on Google is very confusing. So go to this walk's details here on AB and click on the blank 'where' map in the right hand column and then zoom in. You will see that Main Arm Road becomes Skyline Road and then Manns Road beyond the junction with Middle Ridge Road on your left. 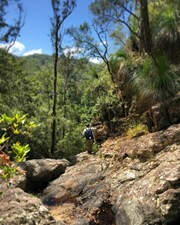 You can also see Middle Ridge Firetrail on the right, which is where the trail starts. 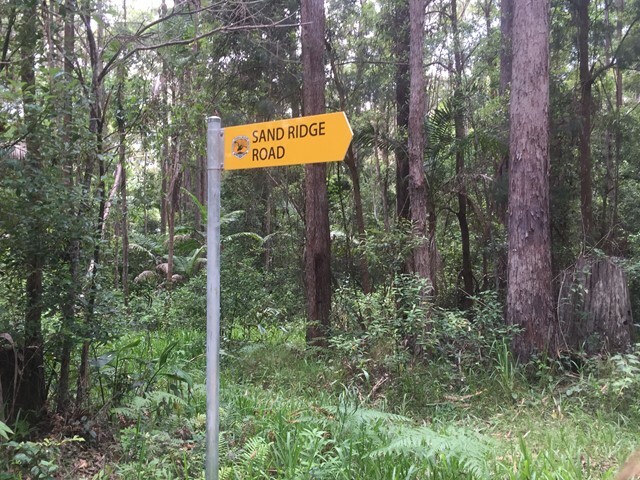 Yes there is 3.5km of gravel/graded road to travel on, but you do not need a 4WD unless it really wet and none of this is on private road/property. Hi there, I haven't done this walk but I would like to. I was lucky enough to meet a local out for a walk with his child and ask for exact directions. Road names are un-signposted now that the roads have become gates tracks. It was worth persevering, as the end result was spectacular in this hidden gorge. I must have spent over an hour just soaking up the atmosphere and enjoying my lunch. The water was tempting, but at about 10 degrees, it was an up to your knees job. Fully intent to take the rest of the F.A.B family in later in the year.